Apple’s putting up iPhone patents at an incredible rate: Two new applications, one for a walkie-talkie-like accessibility feature and another for a spontaneous wireless social network are very sophisticated. Apple’s putting up iPhone patents at an incredible rate: Two new applications, one for a walkie-talkie-like accessibility feature and another for a spontaneous wireless social network are very sophisticated. Is iPhone 4 going to be super-awesome? The first patent has just been uncovered by Apple Insider, and it dates from November. It’s concerned with the back-end data servers that cell-phone-network providers use to route SMS text messages to and from their user’s phones. Apple’s patent notes that these may be capacity-limited if a flood of messages arrives at once, and that SMS’s aren’t an ideal system for the visually impaired user. What Apple’s essentially suggesting is that in future iPhone tech you’d be able to voice-SMS someone, with an electronic voice recognition and generation system handling the data-to-audio conversions at either end. The system could also just display the received SMS as text, like usual, or it could send a real voice snippet instead. Allowing quick exchange of these voice snippets, outside of the usual direct voice-to-voice data streaming of a phone call would also constitute a “walkie-talkie” mode for the smartphone. 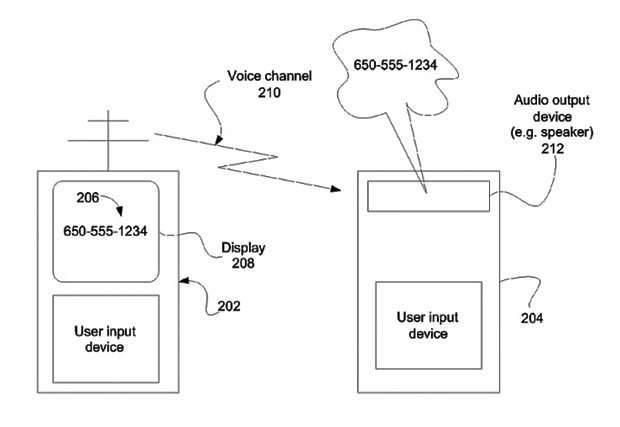 And this is the clever, and potentially far-ranging bit of this patent: Apple’s trying to reinvent how SMS and simple voice chats work over a cell phone grid. The other patent has been dug up by Patently Apple, and it’s just as far reaching. It taps into the whole social networking phenomenon and advanced wireless tech, with the creation of something you may dub an “iGroup.” It’s designed to allow groups of friends who’re attending a public event like a concert to share communication with each other in real time, by automatically forming an ad-hoc real-time social network that’s also a wireless comms network between their phones, centered around an “access device” like a router. 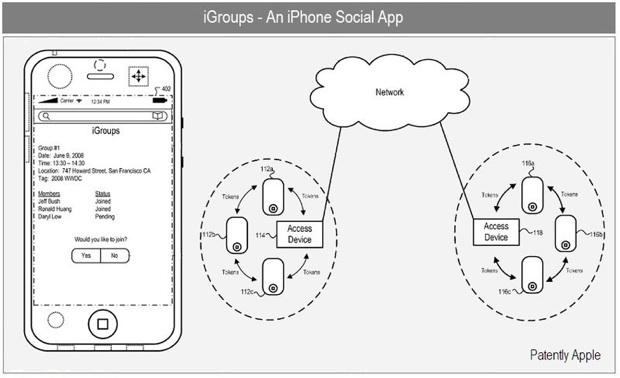 Digging through the patent details, the notion is that smart wireless data “token” sharing between nearby iPhones (with MobileMe acting as a back-end geolocation server) would allow a dynamic wireless social net to be created. The uses for this are potentially very powerful: Imagine setting up a system that auto-identifies attendees of a conference, and gives the organizer the chance to bulk-SMS them. Or even to roughly track attendee’s movements using phone-to-phone token exchanges as a form of location detection. There’s also a host of the usual social media tricks that could come into play–broadcasting of coupons, timely news, or even highly-targeted advertising. Combined with other recent patent apps, and knowing that Apple sometimes does engage in last-minute patent protection when a new device is en route, we are suddenly wondering if the new iPhone version due around June 2010 will be much more of a paradigm-shifter than the iPhone 3G S was. To see if Apple turns all these ideas into neat new hardware, follow me, Kit Eaton, on Twitter. If you’ve got a barcode reader app on your iPhone, then that QR link will take you to Twitter too.